Join in on the fun of playing tennis at school with classmates and friends! ANTS brings everything to your school*, and has a program that is ready to teach children the skills they need to have fun and play tennis! *ANTS brings equipment (Nets, Lines, Balls, Teaching Tools, Coach, Etc.) to set up courts on the blacktop space at school! ANTS size Nets and Courts. ANTS courts are smaller and age appropriate! ANTS Tennis Balls. We utilize larger foam balls that bounce and travel slower, making it possible for your child to play REAL tennis! ANTS Trained and Qualified Coach. ANTS coaches focus on your child being safe and having FUN first! 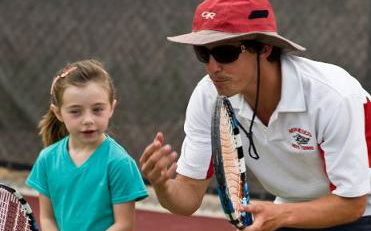 Second, ANTS coaches focus on having your child play tennis! All children registering for ANTS Tennis are required to have an age-appropriate size racquet. If your child does not have an age-appropriate size racquet, simply respond "yes my child needs a racquet" during registration and we'll provide your child with a racquet that fits him/her! ANTS age-appropriate racquets cost $25 plus tax. Weather Cancelation Policy: If it is to rain and we can not play, ANTS will provide ( 1 ) makeup class to be scheduled for the same time and day at the end of the season. 1) By teaching kids with the correctly sized equipment, they are able to teach them quality from the beginning rather than having to correct bad habits and form due to playing with/or on oversize equipment. Therefore they can focus more on practice AND play, rather than just practice. We all know you learn the most through play! A great example is the following Field Of Dream video. 2) More kids are playing the game of tennis and are sticking with it. Countries with a strong progressive system have retention rates in tennis as high as the next most popular youth sport (soccer). They are able to do so because the children can now not only learn tennis is a better fashion (as mentioned above) but they can also begin to play it at an earlier age. You can see such evidence by watching the national championship video here. These kids are playing the best tennis possible, because of the fact they are playing on courts that are meant for their size! Just because they are good, doesn’t mean they need to move up on to a different court, rather they need to learn all of the layers of the game that exist. Our coaches are all trained to develop the overall agility, balance, and coordination (ABC’s) of the athlete, as well as the tennis specifics needed for your child to get better. Tennis is a sport of depth and layers and it takes time to put all of them together and our philosophy is to have them play and use the depth and layer(s) they currently have, while continually developing their parallel skills. Curriculum and equipment that is focused on the ABC’s (agility, balance, coordination) of the player, strong fundamental development, and having fun!. They will learn how to send and receive, track, move to, and hit, the ball! We always maintain a fun and supportive environment. Curriculum and equipment that is focused on the ABC’s (agility, balance, coordination) of the player, but also designed to help them learn all of the fundamental elements that are necessary to begin to play and compete in a healthy, fun environment. They will learn everything from boundaries, footwork, and strokes to scoring, sportsmanship and etiquette! Always fun and supportive! Curriculum and equipment that is focused on the ABC’s (agility, balance, coordination) of the player, but also designed to help them get up to playing and competing speed with solid fundamentals as soon as possible. With more drills designed for higher intensity practice and play. Always geared towards having fun and staying positive both when practicing and competing.